There is nothing quite as satisfying as mastering dough. The possibilities of what you can create are endless when you have a solid recipe and a little bit of knowledge. 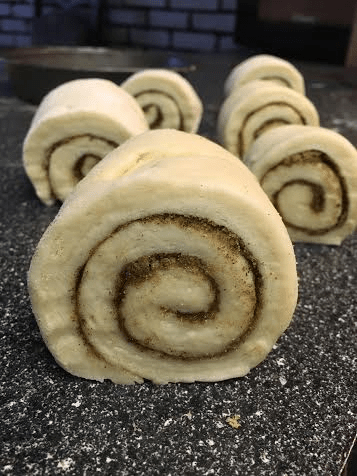 A few notes on the following recipe: the flour total in the recipe also accounts for the flour you use to flour the surface on which you will be rolling the dough out on. Do not add all the flour to the mixing bowl, save a bit for the counter. If you have a thermometer do use it the get the temperature of the milk, butter and sugar mixture. If it gets too hot it will kill the yeast. In a mixer bowl combine 2 cups of flour and the yeast. Over medium low heat, heat the milk, sugar, butter and salt to 115 degrees. Add the liquid to the flour mixture. Add the eggs. Using the dough hook beat at low speed for 30 seconds. Turn the mixer to high and beat for 3 minutes. Turn the mixer to medium and add 2 cups of flour. Knead the dough for 4 minutes. If it is sticky you can add a few tablespoons of flour. Knead for 2 more minutes. You should have a moderately stiff dough that is smooth and elastic. Form into a ball and place in an oil rubbed bowl. Be sure to roll the ball to ensure the entire surface is covered in oil. Cover with plastic wrap and a tea towel. Place it somewhere warm to rise for an hour. After an hour punch down and divide in half. Allow to ret for 10 minutes. On a lightly floured surface roll half the dough to a 12 x 8 inch rectangle. Brush the surface with melted butter. 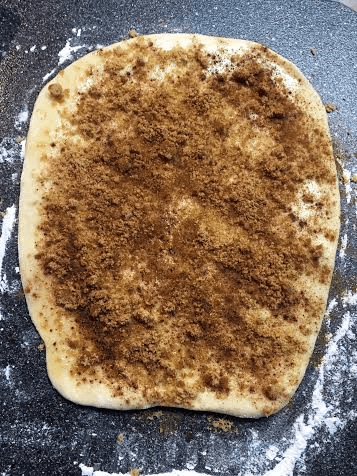 Combine the cinnamon and sugar. Sprinkle the surface with the sugar cinnamon mixture. Starting with the longest side roll the dough, pinch the seam to seal. Set aside with the first roll. Lightly cover with plastic wrap and allow to rest for 10 minutes. Spray pans well with non stick spray. Using a serrated knife slice the dough into 2 inch rolls. Place in prepared pans leaving space between each roll. Pour 1 cup of whipping cream over the rolls, split between the number of pans used. Remove from oven and invert on a plate. Allow to sit for 5 minutes before removing pan. It is something that needs practise but once you get the feel for it you’re golden! A lot depends on the recipe as well. There are many out there but you’ll find one that you keep going back to. Buns are a good place to start. They are easier to form then bread and freeze well if you have a lot on hand. Hey Wanda! Definitely a family favourite. I agree Julia, they look really good! I enjoy slicing them in half, buttering them and toasting them in the oven. Would be nice for Easter brunch. I agree, dough has to be mastered! I’m not very skilled in baking bread (yet) but this definitely makes me want to learn faster. They look divine. 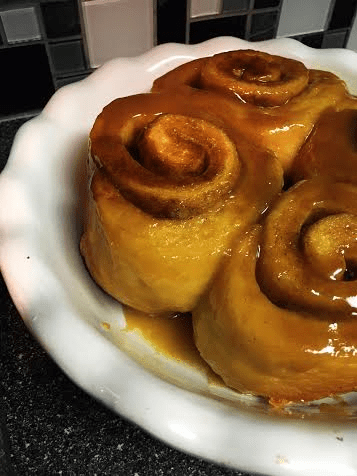 I love cinnamon buns but my family loves them more (if that is even possible). Now you’ve inspired me to make some soon! Yum! 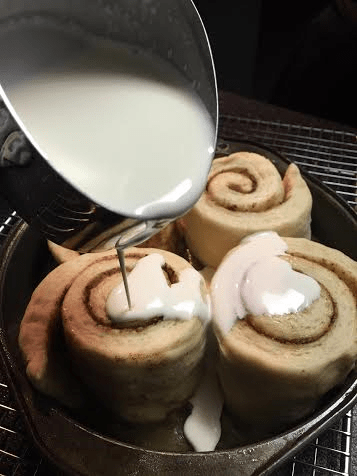 Love cinnamon buns and they looks great. Perfect for Easter! Hey Nicoletta! There is something soothing about working with dough isn’t there. The cream makes then soft and creamy. Definitely a great thing to make when you want to get your bake on! I’ve always wanted to make cinnamon buns but I am procrastinating 😉 . And it’s not for not loving to have my hands in the dough…that’s what I like best! I also love them! Ok, now that I saw how absolutely fantastic yours are and what a great recipe to follow, I want to make them!